We value our customers and we do our best to packing and shipping books to respond to their demands. We consider their continuous satisfaction a fundamental factor to our development. RUI O. - Lisbona . All transactions went smoothly, the books reached me (safe and sound) oversees, and they were in the exact (and excellent) same conditions as they had been described. Highly recommended. SIMONE M. - Princeton NJ. KORVIN A. - Paris . Excellent service, perfect packaging and fast delivery - thank you very much! JANA F. - Kiel . We ship Tuesday through Saturday. The parcels shipped Saturday will be actually sent out on Monday morning by our Postal Office. Check below processing times during holidays. During times of holidays (especially August) or heavy order volume (especially December), dispatch may take up to 7 business days to process so please plan accordingly. We will post estimated processing times on the NEWS page. A good idea: we are able to accept phone orders that help us to expedite the processing. During holidays or the high volume Christmas season estimated delivery times are the faster via phone than via e-mail or through our on-line shopping cart. We accept delayed-ship orders. You may place your order now and specify the approximate future date you’d like your shipment to arrive. We’ll schedule shipment of your order so it arrives as close as possible to the date you specify. Check our NEWS page to check our work calendar. We stand behind our service 100% and strive to keep you completely satisfied with your purchases. We describe with as much accuracy and detail as possible the books: virtually everyone who orders from us is delighted with their purchase. Our customers' satisfaction is very important and we do our best to solve any problem may occur. All items ordered via the website are returnable within 7 days of receipt, provided they are returned with proper packaging and insurance at sender's expense (please call or e-mail us first). Shipping costs are unfortunately not refundable. All shipping methods are safe, with tracking code. Suitable for small books up to 5 Kilograms. You can pay with cash on delivery (it will add 2 € to quoted shipping charges). Suitable for big books, encyclopedia up to 30 Kilograms. You can ask for insurance ( it will add 3 € to quoted shipping charges). You can ask for insurance (it will add 3 € to quoted shipping charges). (*) The estimated shipping time frame counts the 1st business day after the date the order is processed and it does not include Saturdays, Sundays, and holidays. We ship orders Tuesday through Friday. For orders up to 50 € we offer free shipping. 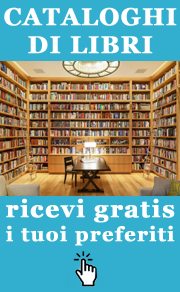 Discount can be provided for all direct orders: e-mail orders, phone orders and online on Bergogliolibri.it (please note it can not be applied if you order from different e-commerce). Suitable for small books up to 2 Kilograms, it's a safe shipping method, with tracking code. Delivery time and cost depends on weight and destination. Mbag can be Economy / Registered (with tracking code) / Premium (faster). Despatch within 7 next working days. For orders up to 50 € we offer discount on shipping rates. [*] Important: in the tables we quote ESTIMATE shipping for international delivery. In fact it is not possible for us to calculate the exact quote solely based on the final value of your order. In the tables here below you can find standard postage for Europe and Russia. Because the weight of books varies we can provide exact costs of postage on enquiry. NOTE: Import taxes may incurr locally and are the responsibility of the recipient. In the tables here below you can find standard postage for North America (including Canada, U.S.A.). * M-BAG Economy and Premium are available for Canada and U.S.A. but there isn't tracking number service. In the tables here below you can find standard postage for South America. In the tables here below you can find standard postage for Asia. In the tables here below you can find standard postage for Australia and New Zealand.